All transactions are safe and secure with a reliable history in online purchasing behind each of our associates. Buy the Fear and Loathing Rick and Morty t-shirt to own Fear and Loathing clothing and merchandise. Pair this impressive Rick and Morty parody design with a Bat Country Fear and Loathing in Las Vegas t-shirt. The combination will bring back memories of Raoul Duke (Johnny Depp) riding in his Chevrolet Impala convertible. He holds a flyswatter in his left hand in an attempt to ward off the bats, which he believes are swarming around the car. You'll find yourself reciting Johnny Depp's popular Bat Country quote from the movie. Wear this to visit beautiful Bat Country in Barstow, Ca. Look for matching Bat Country Fear and Loathing hats and hoodies which are also available. 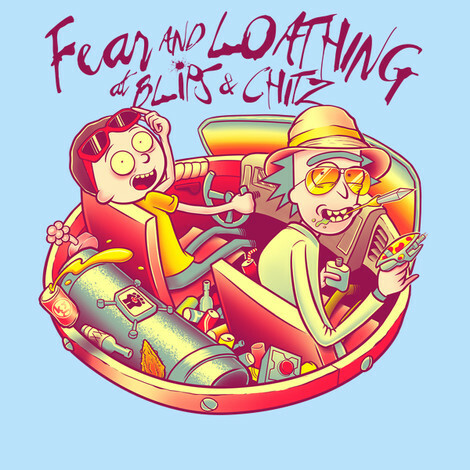 In addition to the Fear and Loathing Rick and Morty tee above, browse the Fear and Loathing Clothing Gallery for more apparel like men's and women's clothes, kids shirts or hoodies.